Native Instruments' Reaktor is a patchable 'build-your-own' environment and a platform for music creation in its own right. For Reaktor version 6, NI introduced Blocks – ready-made components that had an easy-access, pre-built front panel, blurring the lines between building on the circuit-level and the modular-level. Now with its latest version 6.3 update, Reaktor is making those lines fuzzier than ever before, introducing the ability to patch and re-route those Blocks from the front panel. The system does things visually, using virtual patch cables to drag, disconnect and reconnect. To facilitate this, there's a new 'Rack' file format that allows you to "save patches with your DAW session". A new 'Port & Wires' view is available at the top of the interface. Currently, the system only works using NI's own Blocks and those made 'officially' by third parties, although functionality for Racks from the User Library should be on the way. A new entry in Native Access – Blocks BASE – now provides more NI Blocks. These are geared towards newcomers, offering the bare bones modular setup, with Oscillator, CV Processor, SVF, LFO and so on. This update comes with a background. With the growing popularity of pay-per-module virtual modular systems like Cherry Audio's Voltage Modular and VCV Rack, the virtual patching scene is hotting up. 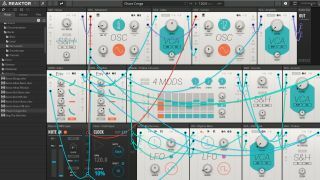 With front-panel patching of Reaktor Blocks – and later third-party modules, NI might well be hoping to pick up some of this market. Current Reaktor users can download the latest version using Native Access; new users can find out more on the Native Instruments website.